First off, I have to tell you guys that you are the sweetest! I received so many lovely comments from my last couple of posts, I just can’t believe how many of you take time to stop by and leave such nice comments! So Thank You!! And thanks for all of your great quilting advise, now I just have to make a decision. (not my strong point) I really am trying to be better at replying to comments I promise! But for some reason I can’t comment on any blogs which have the embedded comments right on the blog post, so for all of you I really did try and want to say hello and Thank you! Hopefully blogger will fix that soon, I know there are lots of other people having the same problem! 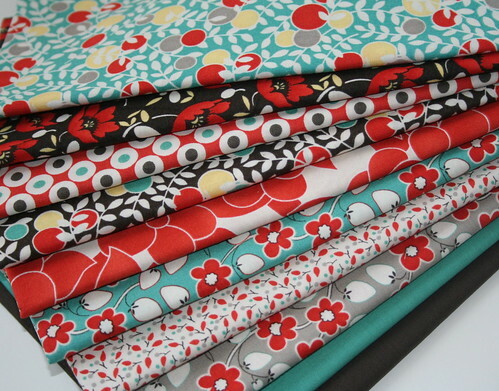 And back to the fabric…….this is my new favorite, Hello Betty in Retro. I am in love with these colors!! I had a hard time not buying the whole line, but I did refrain. I’m not sure what I’ll do with these yet, maybe another future quilt? Probably. I too love this line and the colors. I’ve admired it for a little but haven’t done any purchasing :) It would make a fantastic quilt! If it happens I can’t wait to see it. This red/blue combo is my current fav right now. I may have to duplicate what you have here! To bad I already spent all of my money otherwise I would have to go out and buy this line too. I love reds and turq. so much!! I bought a layer cake of the same prints and now am itching to do something swell for my sister-in-law. She has this very lovely, pottery barn with vintage flair, house, and Hello Betty seemed perfect. I know I have until September, but I just can’t wiat to make something fun. Can’t wait to see your ideas. They are lovely! Gorgeous colours! I love this!! I need to buy these, they are too cute! I have been wanting to make a red and aqua quilt. This would be perfect! Thanks for leaving a comment on my blog. After I left my comment last night on yours I bought some charm packs online of the Hello Betty fabrics! I don’t know what I am going to do with them, maybe that aqua and red quilt. Maybe I can get some solids to go with. Can’t wait! Those fabrics are amazing. I have not seen them in my quilt shop yet. What a great color combo. Can’t wait to see what you do with it. So cute Allison. I am sure you will find something cute to make with it. I wish I had more time to do that.